Whether you need a back-to-school gift for your child's teacher or you are creating a centerpiece for your dining table, making life-size felt apples and pears is a quick and simple sewing project. Perfect for the beginning sewer or a seasoned pro, felt offers a no-fray edge and can easily be manipulated when stuffed. Either fruit can be made using one craft sheet of felt, but scrap bits of felt left over from previous projects can also be used. 1. 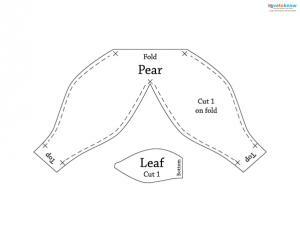 Print the patterns for the apple and the pear. Click on the pattern images, save and print. If you have trouble printing the patterns, try these helpful tips. 2. Cut out the patterns. Fold one piece of felt in half. 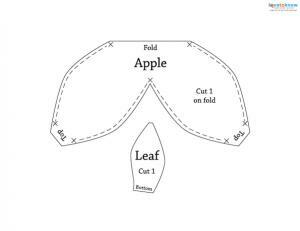 Pin the apple or pear pattern on the felt, lining up the folded edge with the edge indicated on the pattern. Cut out the shape. Do not cut the folded edge. Repeat with the remaining pattern piece. Cut out one brown or green leaf for each fruit. Felt cut out of apple, pear and leaves. 3. Working on one fruit at a time, pin together the edges of two sections that are right next to each other. Pin the edges from one "X" to the other "X," where indicated on the pattern. Repeat until all of the sections are pinned together. Using a scant 1/4-inch seam allowance, sew from "X" to "X" on each pinned edge. Back-stitch at the beginning and end of the seams to prevent the stitching from pulling apart. Stitched sides of apple and pear. 4. Turn the fruit right side out (push the bottom up with your finger and out the top opening) and stuff. 5. Thread a long, soft-sculpture needle with approximately 18 inches of embroidery floss that matches the felt of the fruit you are working on. Knot one end. Sew a running stitch around the top opening of the fruit. Pull the thread to gather, leaving a 1/8-inch opening. Make a few stitches to hold the gathers. Do not cut the floss. 6. Insert the needle through the opening and straight down to the center bottom of the fruit. Pull the needle out the bottom and cinch tightly to create an indentation in the fruit's top. Insert the needle beside the point where the needle came out the bottom. Push the needle back up to the opening. Pull the needle out the top and cinch to create an indentation in the bottom of the fruit. Knot and cut the floss. 7. Break 1 1/2-inch twigs for the fruit stems or, for cleaner cut ends on the twigs, use gardening pruners to cut the stems. Apply a small dot of craft glue in the openings of the fruit. Place the bottom edge of a leaf over the glue. Using the blunt end of a wooden skewer, push the end of the leaf into the hole. Apply another drop of glue in the hole and insert an end of the twig. Finished with leaves and stems. Make a longer lasting pattern: If you would like to print your patterns on card stock for a longer-lasting pattern, you can trace the shapes onto the felt using an ink pen. After removing the pattern, pin the felt before cutting to prevent the layers from shifting. Experiment with wool felt for eye-catching fruit: Machine wash and dry old wool sweaters to felt the wool. In most cases this will create a thicker felt. You may wish to enlarge the patterns slightly to accommodate the bulk while turning right side out. Kisa over at Ohayo Okasan has a cute felt banana project that looks good enough to slice and put on your morning cereal. Enjoy the goodness of summer with the mouthwatering felt strawberry tutorial by Abby at While She Naps. Finish filling your felt fruit basket with this bunch of plump felt grapes found on While Wearing Heels. Making felt fruit is an easy project that requires only minimal sewing skills. With these easy, do-it-yourself patterns and simple instructions, you'll be able to finish this project idea in no time at all - and you'll have lovely felt fruit to show for your efforts.